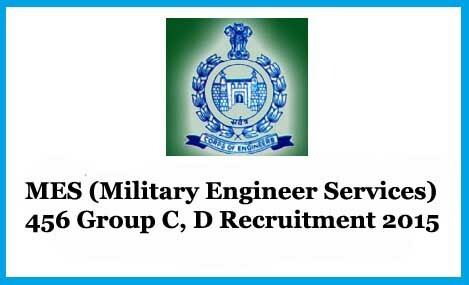 MES (Military Engineer Services ) invites application for the recruitment of 456 Group - C and Group - D posts (raughtsman, Chowkidar, Civil Motor Driver, Supervisor Barrack & Store, Meter Reader, Caneman & Safaiwala.). Qualification: 3 years Diploma in Draftsman (Civil Engineer) from a recognized Institution. Qualification: Matriculation or equivalent exam from a recognized Board/University. Qualification: Matriculation or equivalent exam from a recognized Board/University and Valid driving Licence. Qualification: Degree of a recognized University in any stream with diploma in Material Management OR Diploma in Civil/ Mechanical/ Electrical from a recognized Institution. Qualification: 10+2 or equivalent exam from a recognized Board/University. Age Limit: 18 to 27 years (as on 28/09/2015). 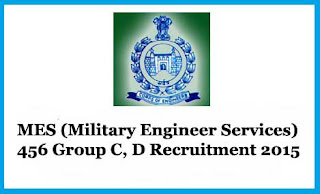 How to Apply: Interested and Eligible candidates may apply in prescribed application from along with two (02) self-addressed (28×12 Cms) envelopes with Rs. 60/- postal stamp on each, self-attested copies of educational careers records, caste and passport size photographs to the concerned MES centers post wise as per official Notification on or before 28.09.2015. Those candidates are coming under remote area on or before 03.10.2015.